Charles Sidney Willsher was born in Mason City, Iowa, on November 17th, 1918. He grew up in humble surroundings with his sister in a small town in southwestern Minnesota. When he was thirteen, his father died, leaving the job of being “the man in the house” to Charley. Charley took on several different jobs working for others and for his local school in order to help provide for his family. After high school graduation in 1937, he started work as a “soda jerk” at a local drugstore and worked there until he heard the news about Pearl Harbor and decided along with thousands of others to enlist. 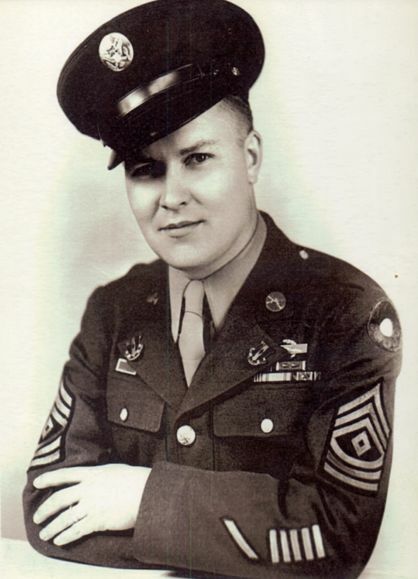 In January of 1942 he was inducted into the army at Fort Snelling, Minnesota, and then was sent to training camp at Camp Wolters in Texas and then to Fort Bragg in North Carolina where he was assigned to Company K, 60th Infantry Regiment, which was a Rifle Company. Following the tour at Fort Bragg, the troops were loaded on Troop Transports at Norfolk, VA and left the United States on Oct. 23rd, 1942. 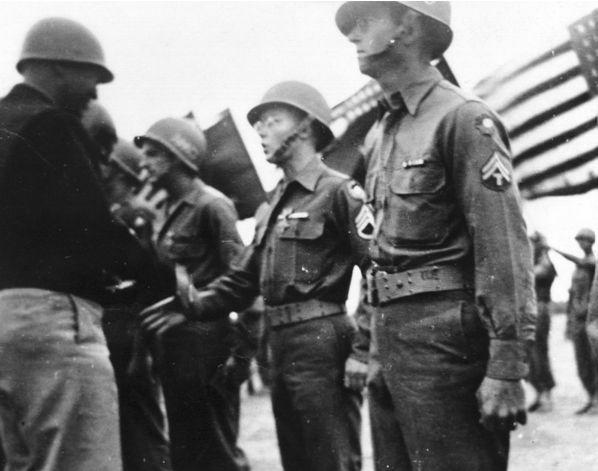 After two days at sea, they were told that they were going to North-Africa; the 60th Infantry Regiment’s directions were to subdue the shore batteries at Mehdia and Port Lyautey in French Morocco and capture and hold the airports there. Their first fight for North-Africa was over in three days. Then they headed for Algiers and Tunisia in February of 1943. On February 27, 1943, Charley was made Staff Sergeant. On March 29th, 1943 he led fourteen men into the conflict at Maknassey, Tunisia. Later he received the Distinguished Service Cross and a Purple Heart for his role there. By April 21st, 1942, his unit started hiking northward toward the Mediterranean through the mountains and toward the city of Bizerte in Tunisia. On May 8, they attacked and captured the airport at Bizerte and by May 9th, the fighting was over in North-Africa. They traveled, often by foot, from North-Africa to Sicily, and then on to England. From here they went to Normandy in France, where the fighting was especially difficult in hedgerow country. On July 25th, 1944, Charley was wounded again and sent to England to recoup. When he returned to his unit by September of 1944, they were sent to the Ardennes and the Hurtgen Forest, then to Nordhausen Concentration Camp. On May 9th, 1945, all hostilities in Europe ceased. In three long years, Charley had fought in seven campaigns. In September of 1945, he returned to his hometown and decided to get married and settle in the place he had always called “home”. By November of 1946 he had a wife and a baby daughter. He started working at Northwestern Bell Telephone Company and continued there for thirty-six years until his retirement in 1980. In the early years there were many nights when he was called out to work on the lines that had been downed by storms. In later years, he adjusted to new technology and spent more time in the office troubleshooting. After his retirement in 1980, he spent many hours in service to others. He had learned as a boy to find work by doing the kinds of things that others needed. As a retiree, he returned to this ethic and became a handy-man willing to take on many different kinds of “helping” jobs. He kept busy by making and repairing numerous items for friends and family members. Throughout his life, he demonstrated to others that he was a man of courage, responsibility, compassion, creativity, loyalty, honor, integrity, and service. This was his legacy. Throughout all of his post-war years, Charley was plagued with severe and untreated PTSD. He could never reconcile having killed and being called a hero with his religious beliefs gained in his childhood. In the 1980’s, he wrote his memoir and gave copies to anyone who wanted one. Telling his story helped alleviate some of his PTSD symptoms, but did not eliminate them. Charley died in 2006 after having spent three years in a Veterans’s Home in Luverne, Minnesota. He had been diagnosed with Alzheimer’s Disease and spent his last years in comfort and with the kinds of people he loved the most: other veterans. In 2007, his daughter Janelle Kaye, decided to include his WWII memoir along with their family story about coping with PTSD in hopes that it would be inspirational to others facing some of the same kinds of issues. This book called “Reconciliation with War: A Family Journey“, by Janelle Kaye, MA, and Charles Sidney Willsher, is available at Xlibris.com, Amazon, Barnes and Noble, and other literary outlets.